There is a sense of unease beginning to emerge as livestock producers and processors begin to realise the potential damage which may be inflicted on the livestock industry as valuable sources of animal feedstuffs become diverted towards producing renewable energy from anaerobic digestion (AD) and biomass plants. As most of us realise, climate change is a fact and government has to reduce emissions and encourage behaviour which will be less damaging to the planet. The promotion of renewables over the use of fossil fuels to generate our energy has been main stream government policy for some time now encouraged by varying financial incentives. However, it is becoming apparent that more thought should have gone into the unintended consequence of some of these policies. Changes to financial incentive schemes have encouraged a headlong drive towards anaerobic digesters to produce energy, sometimes for home use to dispose of waste products such as slurry and to offset energy costs, but increasingly, as large-scale money making commercial ventures. The 27 AD plants in Scotland are soon expected to increase to 56 requiring 25,000 acres of our best arable land to feed than as well as hundreds of thousands of tonnes of draff. Biomass systems have also seen a surge in popularity with many a drafty farmhouse and grain dryers fuelled by biomass wood chip or straw burning boilers as well as more commercial plants such as the recently opened Helius CoRDe plant in Rothes, Speyside, which has an annual fuel requirement of 115,000 tonnes of wet draff from local whisky distilleries and 60,000 tonnes of wood chips. The explosion of AD and biomass plants will inevitably have an impact on food production. Not only will arable land which used to produce food now be devoted to producing energy, which doesn’t make sense in a country that imports 60% of its food, but land hungry digesters will price land out of the market for new entrants and other farmers, concentrating large areas of arable land in increasingly fewer hands as large well capitalised businesses swallow up any available land in the locality for lucrative energy production. Cattle producers in the fragile areas are already feeling the pinch with draff and dark grains in short supply amid doubts as to how long they will be available. We are faced with the ludicrous situation of dark grains being hauled to the north and east of Scotland from as far away as Humberside while draff is being hauled from Speyside to AD plants near Glasgow. The surge in the use of straw as a fuel for biomass boilers is already affecting the straw market. Straw is in short supply, currently trading for as much as £15 a bale and set to rise after next harvest. With energy producers tied into long-term contracts this will become a recurring problem and could eventually add to the exodus of cattle from the hills and glens. The Scottish Government has committed to carry out an assessment of the impact of the rapid growth in the renewable sector on the agricultural production. If the beef sector is to survive in marginal areas there will have to be controls put in place through either the planning system or by regulating the financial incentives to strike a balance between the competing needs of food and energy production. * Angus McCall farms at Culmaily Farm, near Golspie. 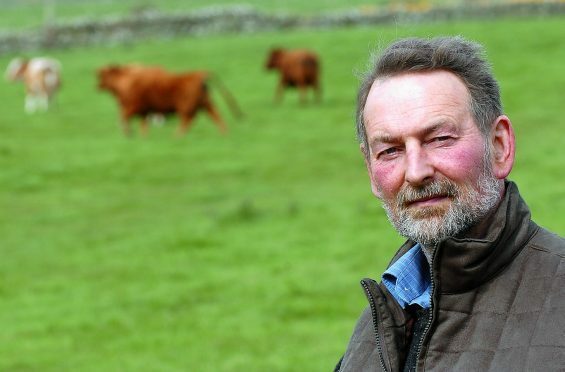 He is an executive director at the Scottish Tenant Farmers’ Association.